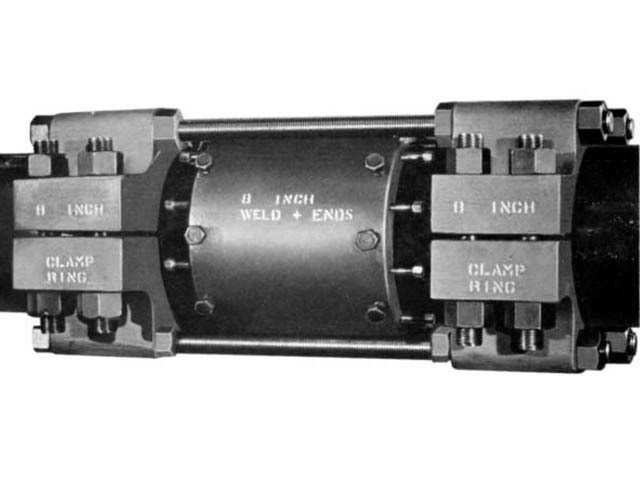 PLIDCO® Clamp+Rings are used with PLIDCO® Weld+Ends Couplings, PLIDCO® Split+Sleeves, or other fittings where excessive end-pull or compression loadings are encountered. They may be used permanently, or temporarily, and are reusable. The PLIDCO® Clamp+Rings are heavily constructed with rings carefully machined to the proper diameter. Tremendous gripping power is achieved. The precision-bored inside diameter of the ring reduces the danger of caving-in or distorting pipe. PLIDCO® Clamp+Rings are especially useful with high-tensile, thin-wall pipe. Designed for specific end-pulls, PLIDCO® Clamp+Rings are shop-tested prior to shipment.